The perfect blend of superfoods: Kale! Cruciferous veggies! Pomegranate! Yes, technically Kale is a cruciferous veggie so I counted it twice, and the pomegranate comes in the form of a molasses, but bear with me. The best part of the salad is that the greens are hardy and less prone to wilt than spinach or a spring mix, so you can save what you can't eat and have a healthy snack for later. The last few weeks we have had a ton of visitors and birthday celebrations, which means I am in dire need of some clean eating and antioxidants. I whipped this up in a mason jar so I could save it easily, and because I like to shake it like a polaroid picture. It is so easy to do, and would be great to whip up before work for a great lunch that won't weigh you down. Shake all ingredients together and set aside. A+ for portability. OK, maybe A- because, glass. 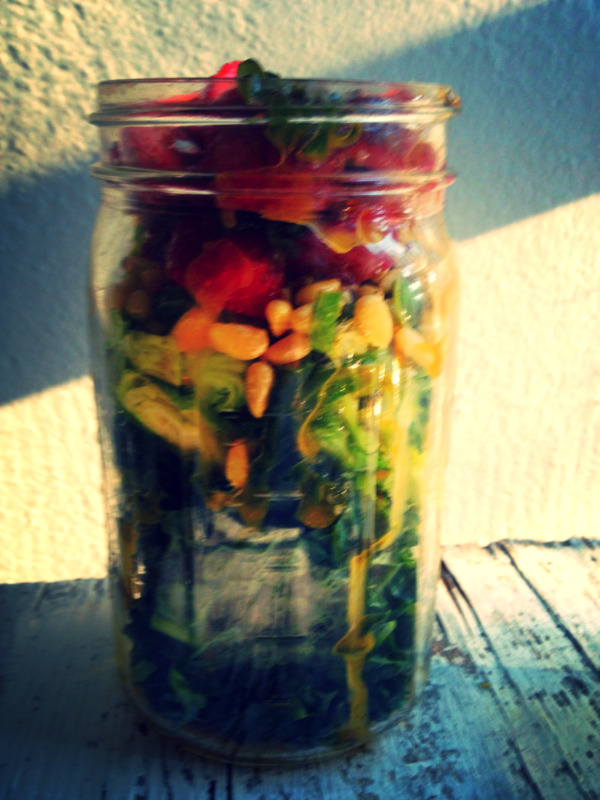 Chop Kale and Brussel sprouts thinly and layer in the jar, followed by a handful of nuts and sliced berry. If the super-crunchy texture of kale isn't your thing, try massaging it first - it seriously makes a world of difference, and it only takes about a minute or two (although other online sources say 5 minutes, I find it doesn't take nearly that long.) Drizzle in the dressing and enjoy! If it looks like there is too much dressing, trust me, you will probably be grateful for it. The kale and brussel sprouts are strong flavors, and the tangy dressing really helps bring out the best of all the flavors.